Acclaimed director and actor Sydney Pollack died of cancer Monday afternoon in his Pacific Palisades, California home. He was 73. The Academy Award-winner rose to critical acclaim with his films “Tootsie” and “Out of Africa,” which won seven Oscars. In his final film — the recent “Made of Honor” — he played the repeatedly-married father of Patrick Dempsey’s character.Pollack was diagnosed with cancer about nine months ago, according to agent Leslee Dart — around the same time “Michael Clayton” was released. Pollack played Marty Bach in the film and co-produced.After spending his early years studying under the legendary acting teacher Stanford Meisner, he eventually became Meisner’s assistant before turning his interest to directing.Surviving Pollack are his wife, Claire; his two daughters, Rebecca and Rachel, six grandchildren; and his brother Bernie. 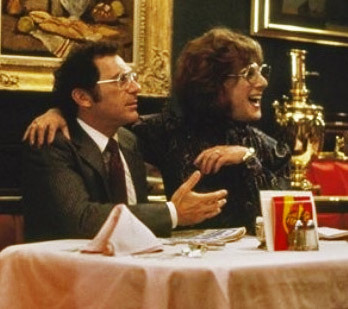 Photo at right: Sydney Pollack alongside Dustin Hoffman as he makes a cameo in “Tootsie,” which he also directed.